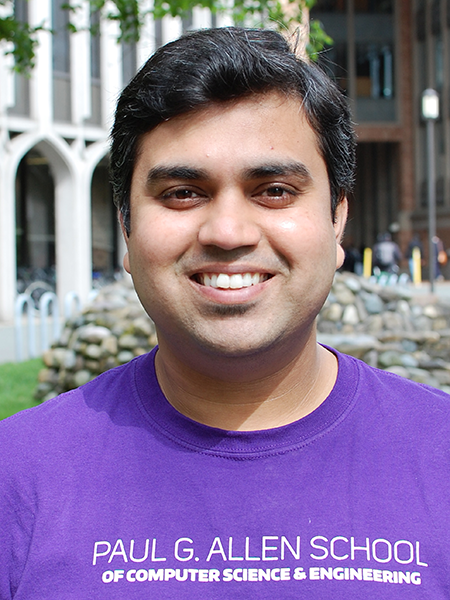 Allen School Ph.D. student Aditya Vashistha has earned the 2017 Graduate Student Research Award from the UW College of Engineering. Vashistha, who is advised by professor Richard Anderson in the Information & Communication Technology for Development (ICTD) Lab, earned the award for his work on social media technologies for the developing world. Vashistha’s research aims to extend the benefits of social computing to the roughly four billion people around the globe who have constrained internet access. One of his early projects was IVR Junction, a system that used interactive voice response technology to enable people with basic phones to participate in voice-based social networks. IVR Junction, which Vashistha developed while working with Bill Thies of Microsoft Research India, has been deployed in remote regions of Somalia, Mali, and India to share news, call attention to rights violations, and report lack of services. Vashistha built on this research with Sangeet Swara, a voice forum that enables low-income people in rural areas to curate and share content on voice-based social networks which earned a Best Paper Award at CHI 2015. One of his more recent projects, Respeak, is a voice-based speech transcription crowd-sourcing app to provide additional earning opportunities for low-income people that earned an Honorable Mention at the CHI 2017 conference. Previously, Vashistha earned a Best Student Paper Award at ASSETS 2015 for his analysis of social media use by low-income blind people in India — an outgrowth of the Sangeet Swara project — and was awarded the prestigious Facebook Graduate Fellowship in 2016. In his letter of nomination for the College of Engineering award, Anderson cited Vashistha’s commitment to service and to producing research with important social impact as being particularly worthy of recognition. Each year, the College of Engineering Awards recognizes the extraordinary efforts of student researchers, teaching assistants, faculty, and staff members. Allen School nominees for this year’s awards included professors Carlos Guestrin and Josh Smith in Faculty Teaching and Research, respectively; Raven Alexander, Assistant Director for Diversity & Outreach, and software engineer Jason Howe of the Computer Science Lab, in the Professional Staff category; and Fiscal Specialist Chiemi Yamaoka in the Classified Staff category. Vashistha and his fellow recipients from across the college will be honored at a campus reception for students, faculty and staff later today. Congratulations to Aditya, and to all of this year’s winners and nominees for your commitment to excellence!